Is the spring broken? Is the garage door not closing? Feel free to call our company for same day garage door service in Tempe. We take care of your repair needs in a speedy way and are also available for a routine inspection. The latter is simply a reminder that many of the common garage door problems can be prevented with regular servicing. It’s also important to remember that the safe performance of garage doors also depends on their proper installation. And let us assure you that whenever you are in need of services, we will send you one of the most experienced and skilled garage door repair Tempe AZ pros. The response is always quick when you need garage door repair in the Tempe community of Arizona. No problem is good news. Aware that even minor issues can bring huge headaches related to your safety and security, we rush to lend a helping hand. Call us if your cables snapped, the overhead door won’t open, or the tracks are bent. Whenever you are faced with troubles, you can also be sure that our company will dispatch a garage door service pro your way in a jiffy. And rest assured that all pros are trained to service any garage door brand. Just contact Pro Garage Door Repair Tempe and a tech will tackle your problem in no time flat. Problems have a tendency to get worse if they are not fixed in time. So, don’t hesitate to call our garage door service company if you hear a noise or see a small gap between the door and frame, or the door doesn’t open entirely. All these problems that seem small and trivial right now will become serious tomorrow. They may become a reason for a break-in or an accident. Why should you let them? Why experience the worse nightmare? 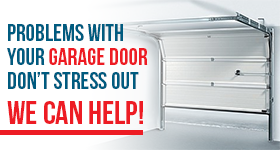 Call us now for the garage door repair service you want. It’s often prudent to have problems fixed before they give you headaches. And that can happen with regular garage door maintenance. You simply make an appointment and a pro comes to inspect, lubricate, tighten the hardware, and make adjustments. Although we are available for same day opener repair, the routine inspection of the operating system and the proper adjustments will not only improve the performance of the electric garage door but enhance your safety too. Let us be of service. Call us whenever you feel it’s time for some repairs or maintenance. We’ll send you the best Tempe garage door service pro to take care of your issue.